The beautiful handcrafted embroidered hand bag from Bhuj, Gujarat. This handmade bag can be use accommodate all your essentials and accessories. The type of closure of bag is by zip with single compartment. Wash with cold water, no machine wash. Size of product: 18" (H) x 14" (L) (with Handle 32"). 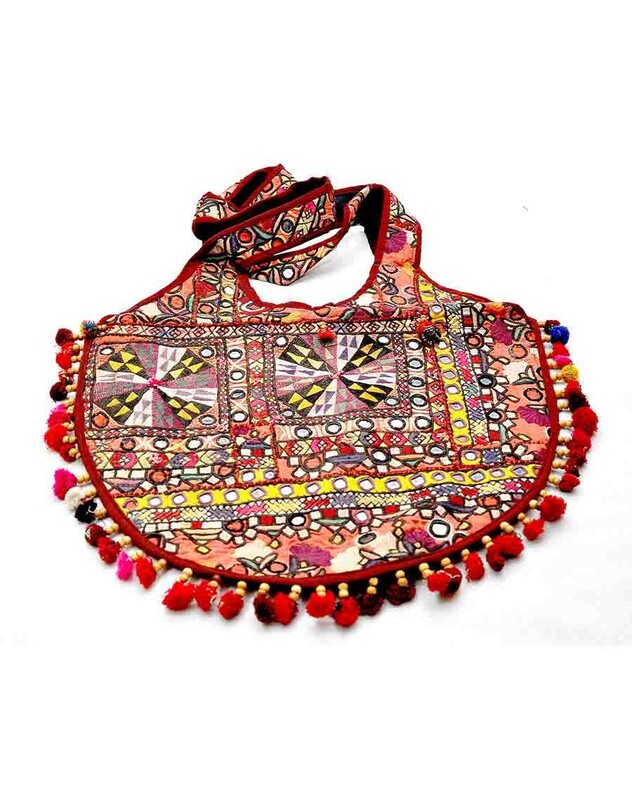 If you want to be unique and trendy bring an element of glamour along with tradition to your outfit with going over the top, this kutch work style bag from our collection is definitely for you. Choose something funny, happy and funky accessories. Go off the tangent; follow a whim and end up purchasing something unique and different. This hand stitched purse is made up of Eco-friendly fabric. • Disclaimer: This kind of accessories product is handcrafted and may have slight imperfection and/or mismatch from the product shown in the image as its handcrafted by the artisan which makes the product unique from other product.